Aristotle's ideas endured and influenced the development of theology, philosophy and science for nearly two thousand years after his death. It therefore seems appropriate that we try to gain a better perspective his life and works. However, because the wider perspective of Greek philosophy and science has already been covered, this will be the briefest of overviews. Aristotle was born in 384 BCE in the north­east part of what is now mainland Greece. At the age of 17, Aristotle moved to Athens and became a student in Plato's Academy, where he remained until Plato's death in 347 BCE. By 343 BCE, Aristotle had returned to Macedonia to serve as tutor to the son of King Philip, who was later to become better known as Alexander the Great. In 335 BCE Aristotle's returned to Athens and for the next 13 years taught in a public gymnasium called the `Lyceum`. Finally, Aristotle moved to the island of Euboea, where he died in 322 BCE at the age of 62. Those intended for formal publishing and, as such, considered to have been written and edited by Aristotle himself. Lecture notes thought to have been used by Aristotle at the Lyceum. As such, these notes cover the breadth of lectures given by Aristotle in logic, physics, biology, metaphysics, ethics, politics and aesthetics over a period of more than 30 years. The theoretical sciences encompassed philosophy, physics and mathematics. While, in contrast, the practical sciences included ethics and politics, with the productive sciences representing the skills required to make things. 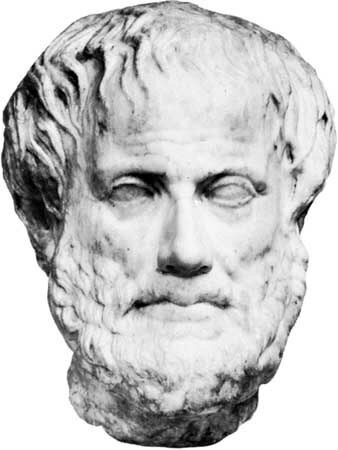 However, more than anything, Aristotle considered logic as a prerequisite to philosophy and the `Posterior Analytics` contains his logic of science. This work is supported by the `Prior Analytics` containing his theory of syllogism, which is a form of reasoning using premises from which logical conclusions are then drawn. Aristotle argues that science must start with certain axioms and demonstrate, by syllogisms, that certain properties belong to certain objects. In this way, contrary to Plato, Aristotle demonstrated that the need for different sciences to begin with different premises. On this note, it is a suitable point to raise the general question concerning Aristotle's intellectual position in contrast with that of Plato. Clearly, both men built on the ideas developed within the tradition of earlier Greek philosophy, but each added their own unique insights. Initially, while at Plato's Academy, Aristotle's own writings continue to follow the teachings of Plato, however after Plato's death, Aristotle's ideas start to diverge from Plato's more metaphysical view towards a more empirical philosophy, more akin to science. Any first change would require something else to exist to cause that change. Equally, to explain what caused a change at a certain time requires some change prior to that time; again leading to the requirement for a change before the first change. Change by the Prime Mover must therefore be eternal. If the universe is eternal, it contradicts the concept of creation. Aristotle believed that the soul was simply the metaphysical `form` of the material body and did not consider the immortality of the soul. His requirement for logical `cause and effect` within the material world contradicts the concept of supernatural miracles. `De Anima` contains Aristotle's ideas of the soul and dismisses the notion of soul and body forming a unity. As stated earlier, Aristotle's view of the soul is linked to the concept of substance comprising of form and matter. The soul is simply the form of the material body. However, Aristotle's writings suggest that he believed `intuitive thought` to be an exception, which did not depend on material substance. In truth, we have barely scratched the surface of the totality of Aristotle's achievements. However, hopefully it is sufficient to reflect how his work, based on the traditions of Greek philosophy, was to help shape the development of theology, philosophy and science. So, given the scope of Aristotle's work, maybe we should not be that surprised that his influence was to eventually become pervasive across multiple cultures. However, that his work should stand, essentially unchallenged for over 2000 years, was undoubtedly both a remarkable and surprising achievement. Clearly, at one level, it reflects the growing need to view the world in a different way, possibly a more rational way. This said, in the timeline of worldviews, it was not Greek rationalism that is to provide the next catalyst, but theology. Some 300 years after the death of Aristotle, a carpenter claims to be the Son of God and becomes the foundation of Christian belief. A further 600 years after that, a prophet called Muhammad claims to receive the word of God, as recorded in the Quran, and founds the religion of Islam. Both of these religious creeds are to become dominant worldviews by the time of the Renaissance period in Europe. Although both these creeds come to embrace aspects of Aristotle's philosophy, both will struggle to incorporate the rationalism implicit in Aristotle's philosophical thinking.